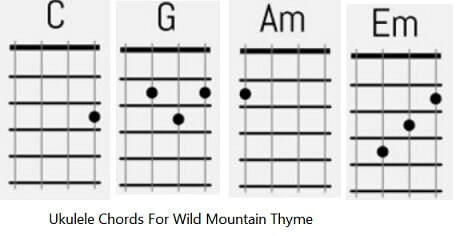 Go Lassie Go /Wild Mountain Thyme Lyrics And Chords. Written By Francis/William Mc Peake, Made famous by The Clancys And Tommy Makem. This song was written and copyrighted in the 1950s and is one of the most recorded songs ever. Recorded by Ed Sheeran in 2017 and named ''My Heart Will Always Be In Scotland''. The ukulele chords are included. Will you [C]go [F]lassie [C]go. Will you [A]go [D]lassie [A]go. Here are a few of the most well known singers to have recorded it - The Clancy Brothers And Tommy Makem, The McPeak Family, Joan Baez With Bob Dylan, The Strawbs [B.Side Part Of The Union] Van Morrison, Rod Stewart who called it Purple Heather reached No. 16 in the charts, Mark Knopfler, Mary Ann Faithful. Derek Ryan has recently recorded it on his album Simple Things which was released August 2014.